Very seldom do out sports heroes live up to the adulation, the fame, the reputation we're led to believe in. Whenever the myth makers and media scribes lavish praise on a star athlete, it typically sounds like cliched lip service- often meant to promote the sport and put their own names into the good books of the team owners and management through such adherence. Those we idolize end up being flawed in several ways, whether by being rude, arrogant, self-serving or just not one who lives by a very honourable moral code. But Roy Halladay was not that sort of idol to let down his throngs of supporters. He was indeed a rare breed of sporting figure. Stoic, intense, exceptionally professional and almost slavishly devoted to perfecting his craft of pitching, the tall and powerful right hander out of Denver, Colorado delivered years of breathtakingly reliable greatness for the Toronto Blue Jays. It was a sight to behold him go from start to finish in so many games. He was a throwback to an era where starting pitchers didn't need a relief pitcher to mop up what they'd built up. Eating up innings like crazy, Roy in fact did that at a pace that no other starter came close to in his prime (ie, from 2002-09 no other two pitchers combined for as many complete games as Halladay had on his own). One of the only unfortunate aspects was that he was doing this under the scope of MLB's American media radar and was far from the spotlight in a Toronto baseball market that had shrunk drastically since its halcyon days of the 80s and 90s. Had Roy been a Jay in the days of Cito, Alomar, Carter, Olerud, etc, with all the championships and glory? Well, perhaps it's a different story in terms of the size of his legacy. Meanwhile casual baseball fans were never too highly aware of his exploits or familiar with what made him so special. But within baseball circles, it was a different matter. Players, analysts and commentators would rave about the man dubbed "Doc," with several claiming him the game's top pitcher even while names such as Randy Johnson, Curt Schilling, Pedro Martinez and Mariano Rivera were the ones winning World Series rings. In the aftermath of his death at age 40 in a plane crash off the Gulf of Mexico Tuesday, we all once again got to hear that respect and adulation put forth. Sadly, it was sooner than we all wanted to hear it considering these words are usually reserved for a ball player's induction into the Hall of Fame. Someday "Doc" will most likely land there, but now we know he won't be in person to see it. Certain to go into Cooperstown as a Blue Jay once his eligibility begins in 2019, Roy unfortunately never experienced the highest team achievements that baseball can bring. That's why it was almost necessary that he move on from Toronto before the clock wound down on his career and that inevitable move occurred in 2009 when he was shipped to the Phillies. He didn't disappoint there, winning the NL Cy Young Award his first season and then the next season posting both a perfect game and the 2nd postseason no-hitter ever. Up in Canada, Jays followers were like proud parents on graduation day to see these feats, as if to say to the fans down south "We told ya so." At this point, the national sports media in the US got a great glimpse of what those in Toronto had already known: Roy Halladay was arguably the greatest pitcher of his generation. Like so many young prospects, Halladay had star potential all over him when taken by the Blue Jays in the 1st round of the 1995 MLB draft. Finally called up 3 years he later, he came 1 out from a no-hitter in his very first MLB start in September 1998. However, the promise shown proved a temporary mirage, as his game slipped drastically. In 2000, he put forth a truly disastrous campaign that saw him set dubious records for awful pitching statistics. Cast off to the minors and already labeled a bust at age 23, he didn't resurface in the majors until partway through 2001. By then, thanks to the tutelage of pitching guru Mel Queen, he'd completely re-developed his technique. This re-invention also involved Halladay instilling intense training methods and he became highly renowned for his razor sharp gameday focus- one that often intimidated members of the media and his own teammates, as Halladay practically ignored all outside noise and interacted with very few souls in his preparation for another start. Like some superstitious hockey goalies of past and present, you couldn't hope to get an audience with Halladay as game time approached. Like the gunslinger of the West he was nicknamed after, people simply just got out of Halladay's way when he walked through the clubhouse. And he commanded that respect by being so very effective in his job. Had he been anything less than great, such antics might have caused a stir and opened up trouble within the organization. But thanks to the resounding success Halladay had, his devotion to the art of pitching- coupled with his natural talents and experience- became fully accepted and soon the stuff of legend, too. From 2002-09, Halladay was simply lights out for a perennially mediocre Jays team that, even with his contributions, could never crack the 90-win mark or even hope to make a postseason, what with their lack of prospects panning out and being stuck behind the rich, powerful and influential Red Sox and Yankees in the American League East Division. Despite all this and the constant struggles with attendance the Jays battled, Halladay never seemed to crumble under the pressure of having to deliver so consistently nor did he bristle openly at the failures of the organization. It was sometimes reported that he even conceded with any salary demands- enough to ensure the Jays could afford other quality players to make that extra leap to the postseason. While that franchise goal never worked out, no one held Halladay to blame. If anything, he kept any dreams of that breakthrough a lot more realistic than they would have been otherwise. It took the Jays another 5 seasons after his departure to find that postseason breakthrough and it has also eventually taken multiple young studs (Aaron Sanchez, Marcus Stroman) just to fill the shoes of the Jays' long sojourn without a true ace like Roy Halladay was. Thanks to the lack of team success, Halladay became one of baseball's best kept secrets and I dare say, even one of Toronto's most underrated sporting legends. While mostly a hockey town, there are a handful of superstars in other sports that Toronto has fallen in love with- most of them Americans that make it big in the "Big Smoke" but go to supposedly greener pastures once the prospect of American advertising and endorsement money comes calling. When Halladay did go, no one held a grudge. Besides, he made sure it was in a trade so he didn't leave the team with nothing in return. And we, his fans, encouraged him to do what the Jays' limitations had prevented and that's make a postseason. He did that, though a World Series proved elusive. Arm troubles led him to calling it quits at a relatively early age for a hurler (36). But again he demonstrated his devotion to the franchise that had made him a household name, as he signed a one-day contract to retire as a Jay. A fitting tribute to him. But also a tribute BY him to the Jays and their fanbase. One has to remember how a shifting pro sports landscape and rapidly escalating salaries saw foreign athletes in Canada wanting to get out once they could cash in elsewhere. Most never seemed to fully embrace their role as a city's hero and cherish it. Many names up and left once they realized financial gains could be greater back down in the US (Robbie Alomar, Tracy McGrady, Shawn Green, Vince Carter for example). For every Michael "Pinball" Clemons who fell in love with being a Toronto sporting star and decided to stick around, there were hundreds of other luminaries who only saw Toronto as where their job was but not home. While he lived in Florida, few showed that loyalty to the city to the extent that Roy Halladay did. That didn't manifest itself in being brash, self-promoting and out in the open to promote themselves- unlike several recent Jays stars- but more through a quiet, dignified sense of duty to the fans and management that believed in him. As for on the mound, Halladay was that rare pitcher who could hold the world's most talented hitters in check for 9 innings and confound them time and time again. It's not often fans pay mainly to see a guy prevent any offensive excitement with his dominance, but with "Doc" on the bump it was truly an event. It's sad that the sellouts and fan frenzy of recent years never happened around Roy's prime, but those who were there to watch him then no doubt felt part of an exclusive, privileged membership. They held a close view of what too many in Toronto didn't get caught up in during those years. Halladay's unflappable exterior belied a burning competitive drive inside him too. He wasn't in the mould of your usual cocky, fiery, Roger Clemens-style demeanour for an ace on the mound. He was more cerebral than that. 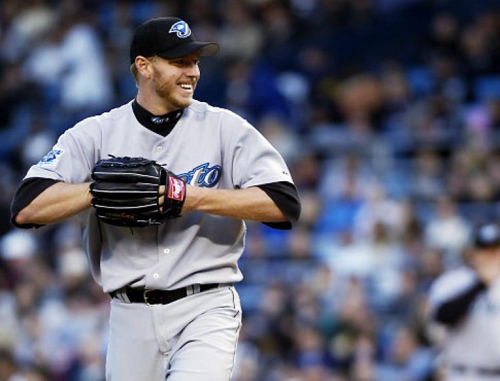 While not known for being engaging, conversational, social or outgoing, Halladay nonetheless was a highly respected leader and role model to many in the Jays locker room over his decade as a pro there. Though stars such as Halladay have an almost otherworldly, non-human quality when you try to analyze them closely (as it's hard for most common folks to relate to that sort of elite talent in any field), he always somehow made himself so easy to like- not just as a player but as a person. With his humility, grounded outlook and simply being an everyday kind of guy outside of baseball, Roy Halladay was one of the few truly modest sporting greats we've seen. It's also been said his interests in family (he was a member of the Church of Latter Day Saints), fishing and aviation ran as deep as any baseball game he ever pitched. The real tragedy here isn't that baseball lost such a notable future hall of fame pitcher, it's that it lost such a truly notable man- a deserving legend that lived up to everything baseball heroes are supposed to be and then some. The game could use more upstanding individuals like that, but unfortunately it just got poorer by one and even worse, with a man in the prime of life. Evan has spent six years at TSN working on the floor. A stat junkie, Evan operates the TSN stats Twitter account.